The Irascible Professor-commentary of the day-2-25-01. But this is not good enough! Commentary of the Day - February 25, 2001: But This Is Not Good Enough! In her recent presidential address at the 2001 annual meeting of the American Association for the Advancement of Science, retiring AAAS president Mary L. Good covered four interesting and important topics. First, she chronicled the rapid and intertwined growth of American science and technology that followed from World War II. Second, she reviewed the rather muddled science policies that accompanied that growth, and argued for replacing the old "social contract" science policy with one driven by the need to emphasize research categories that address critical social needs. Third, she provided a concise overview of recent trends in research and development funding, and questioned whether recent funding patterns threaten to undermine the technological leadership position of the United States. Finally, she examined critical scientific and technological workforce issues including the declining interest of American students in the scientific and technological disciplines. Dr. Good is a chemist with an extensive background in higher education (25 years of teaching and research in the Louisiana State University system), industry (vice-president of technology for Allied Signal), and government (a member of the National Science Board during the Carter, Reagan, and George Bush administrations among other appointments). Clearly, she is in a unique position to comment on the state of American science and technology. The IP agrees with much of what she said in her AAAS presidential address; however, he believes that her emphasis on a narrowly pragmatic science policy is mistaken and that she has failed to understand that the root of our science and technology workforce problems lies in failures at the K-12 level rather than at the college and university level. This commentary focuses on the first area of disagreement. A later commentary will address the scientific workforce issues. Following World War II the federal government markedly increased its support of scientific and technological research through a variety of mission-oriented line agencies such as the Atomic Energy Commission and the Office of Naval Research. However, the most significant development in support for science in the United States following World War II was the establishment of the National Science Foundation. This was the direct result of efforts by Vannevar Bush to obtain government support for an independent agency that would fund basic research. His report to President Truman (Science The Endless Frontier) laid out implicitly the basic premises of the "social contract" between scientists and society. These have been stated succinctly by David H. Guston. They include "the unique partnership between the federal government and universities for the support of basic research; the integrity of scientists as the recipients of federal largesse; the easy translation of research results into economic and other benefits, and the institutional and conceptual separation between politics and science." The underlying assumptions of the "social contract" for the support of basic science are threefold. First, the social benefits from the fruits of scientific research are great; but, it is impossible to predict which advances in scientific knowledge will produce the greatest benefits. The second assumption of the "social contract" is that scientists will exercise good stewardship over the funds granted for the support of basic research. In other words, that those funds will be directed towards those lines of research that appear to be promising, and that the researchers will be productive. Essential to this assumption is the idea of peer review. Peer review originated with the establishment of the early scientific journals. Under this system, the author of a scientific paper has to convince his or her peers of the essential correctness of the work before it will be published. This system was carried over to the government funding process for science. The great majority of federal funds for scientific research are granted or allocated primarily upon the recommendation of reviewers who themselves are scientists working in the field. While far from perfect, the peer-review system largely removes funding decisions from political considerations, and generally ensures that the limited funds for scientific research go to worthy and productive projects. The third assumption of the "social contract" is that scientists will behave ethically in their pursuit of research objectives -- that they will not plagiarize or falsify data or otherwise engage in fraudulent practices. It turns out that this has been a remarkably good assumption. Even though there have been a few high-profile cases of scientific fraud reported in the media, the rate of misconduct in scientific work compared to that in other professions is extremely low. There is a good reason for this. Scientists publish their work. In doing so they voluntarily subject it to the scrutiny of their peers, who are free to repeat the work or to use it as a basis for their own investigations. This process makes the chances for the discovery of fraudulent practices quite high; and, very few scientists are willing to risk their reputations to gain a small advantage through dishonest means. This does not mean that scientific research is free of error. However, the system is self-correcting to a very high degree. One should not assume that the existence of the "social contract" means that a large percentage of federal R&D money goes to basic research. In fact, a large fraction of federal R&D money is spent by mission-oriented agencies for research that is directed at the pressing needs of the government and the larger society. However, the "social contract" does ensure that some federal funding for research supports projects that are aimed at extending our fundamental understanding of the universe around us. While there may well be handsome payoffs from some of this work, they are likely to be relatively far in the future. Both Guston and Good suggest that the "social contract" should be retired. In its place they suggest that our present science policy should be replaced by a system of top-down governance by agencies at the boundaries of science and government. These agencies would assure the integrity and productivity of scientific activity by a system of "collaborative assurance". Agencies such as the Office of Research Integrity would police fraudulent practices, and agencies such as the Offices of Technology Transfer would ensure that all research was in Good's words "programmatically useful for society's needs". Good is rightly concerned about declining federal support for research in general, and perhaps feels that by focussing the efforts of research on societal needs increases in funding will result. The following figure is from her talk before the centennial meeting of the American Physical Society. 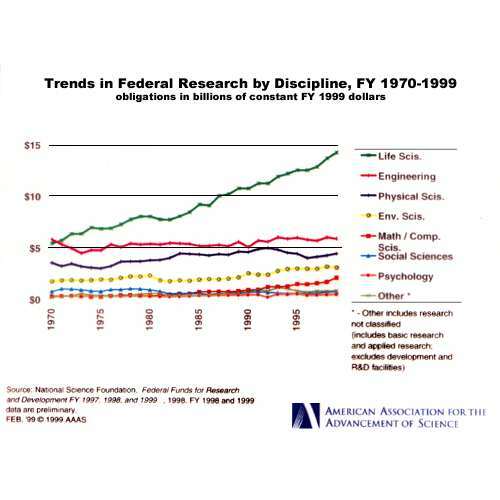 As the figure shows, there has been little real increase in research spending by the federal government in the last three decades in all fields except for the life sciences. As a percentage of the GDP research funding actually has dropped fairly significantly for all fields except the life sciences, and for the life sciences the growth shown in the above figure has only kept up with the growth in GDP. The increases in the life sciences have gone mainly to the National Institutes of Health for medical research. They have been been driven to a large extent by the political realization that we have an aging population who votes. The IP also is concerned about the decline in federal support of research, primarily because research is an investment in the future productivity of society. However, a research policy that focusses entirely on projects that address the short-term needs of society in the long run is likely to do more harm than good. It smacks of the same recent short-sightedness that causes much of industry to focus on results for the next quarter rather than for the long-term. The decline of the great industrial research laboratories has been a direct result of this nearsightedness. It would be foolhardy to similarly focus our federal research support solely on the near-term.